Serrated aluminum button extends 1/4" to the rear for excellent thumb purchase; easy-to-reach without breaking your shooting grip. Uses a modified factory release so no metal comes in contact with plastic magazine. 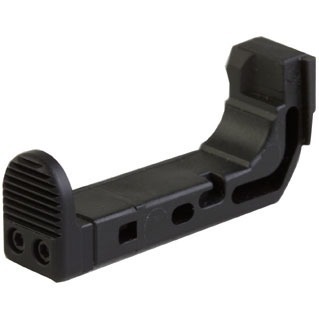 Provides a drop-in fit for small or large frame guns. Will not fit the Gen 4 pistols. SPECS: Plastic and aluminum, black, matte finish. Extends .25" (6.35mm) to the rear. Small Frame fits - 9mm, .40 S&W and .357 SIG frames, including G36. Large Frame fits - 10mm and .45ACP. Will not fit the Gen 4 pistols. Taggete aluminium knappen forlenger 1/4" på baksiden for utmerket tommelen kjøp; lett å nå uten å bryte din skyting grep. Bruker en modifisert factory versjon så ingen metall kommer i kontakt med plast magasinet. Gir en drop-in passer for liten eller stor ramme våpen. Vil ikke passe Gen 4 pistoler. Spesifikasjoner: plast og aluminium, svart, matt finish. Utvider. 25"(modellene mm) på baksiden. Liten ramme passer - 9 mm, 40 S & W og.357 SIG rammer, inkludert G36. Stor ramme passer - 10 mm og, 45 ACP. Vil ikke passe Gen 4 pistoler. This is a fantastic magazine release, and currently resides in my daily carry G30SF. As a guy with relatively small hands, it's always been a hassle breaking a shooting grip to drop the magazine, and the factory extensions don't go far enough to solve the problem. The installation is basically the same as any other Glock mag release, followed by two small screws. The only downside thus far is the small screws can start to rust a bit in humid conditions, but if you keep an eye on it and dab some CLP or similar on them it's hardly a problem at all. I will be returning this mag release it did not have any of the hole drilled or tapped for screws.and the mag release was not extended. Easy to put on and it helps with the mag change! I have 5 of them and love them. One of the best things you can put on a Glock. This was the biggest difference in my reloads in USPSA competition. No need to fudge my grip to hit the mag release. I dont have large hands, so i have to adjust my grip to drop the mag. With this I just drop the mag with no hand movement! I have it on my 21SF for duty use with TLR1 on a Safariland SLS holster. Minor trimming on the holster was necessary so the mag release wasnt pushed accidentally. Bought several more for my other Glocks. I have put these on every one of my 2nd & 3rd gen Glocks. Should have been an OEM product since the day they were invented. Positive engagement, fast mag release, never had an accidental mag drop and never found a holster that they didn't work with. Worth every penny. The mag release is great for a few reasons. No. 1, it is not a metal mag release that can chew up your magazines, no. 2, it goes together simply like an oem part, and then utlized a pair of tiny screws to attach the removeable thumb pad, no. 3, this makes for quick mag dumps a simple task for those who don't have over sized hands for control of the weapon and functions without having to change grip position. The screws and the thumb pad is not polymer which makes for a quality surface that won't get chewed up. It has never failed, come loose (use a drop of locktite for each screw) and it has not made any difficulties for holstering in many brands of holster nor is it sore on the eyes. A+ and I highly recommend for anyone needing something like this without breaking the bank as a few other options aren't priced similarly. In my opinion this is the best extended mag release that Brownells carries for Glock Gen 1-3. I always worry that the screws will strip but they always fit perfectly I have installed 7 of these and all my clients seem to like them. The only mag release I like more is an extended checkered made by zev that Brownells dose not carry hint hint. Plus when you buy it from Brownells there is no risk over the years unlike others they have always treated me more than fairly. I LOVE THIS STORE YOU CAN TELL BY MY CC BILL. Produsentnr. : MRS100BLK Taggete aluminium knappen forlenger 1/4" på baksiden for utmerket tommelen kjøp; lett å nå uten å bryte din skyting grep. Bruker en modifisert factory versjon så ingen metall kommer i kontakt med plast magasinet. Gir en drop-in passer for liten eller stor ramme våpen. Vil ikke passe Gen 4 pistoler. Produsentnr. : MRL100BLK Taggete aluminium knappen forlenger 1/4" på baksiden for utmerket tommelen kjøp; lett å nå uten å bryte din skyting grep. Bruker en modifisert factory versjon så ingen metall kommer i kontakt med plast magasinet. Gir en drop-in passer for liten eller stor ramme våpen. Vil ikke passe Gen 4 pistoler.